“Busy as a bee” is a common metaphor, but sometimes “browsing like a bee” works, too. What my father would think of being compared to a bumblebee I’m not certain, but in this case, I suspect he’d recognize the behavior. Lovely image. Looks like the bee is taking a peek to see whether the flower is worth visiting. That’s exactly what I thought. On the other hand, perhaps he’s calculating whether he’ll fit inside. That’s a big bumblebee, and even though crossvine blooms are large, the fit would be snug. Wonderful image and human link. Don’t you know I giggled when I looked at the bee and thought of my dad? I’m glad you enjoyed it. You might also say the bumblebee was window shopping. I’d not thought of that, but it certainly fits. In this era of online shopping, there must be one or even two generations who’ve never experienced the pleasure of going to town and browsing the store windows. Norman Rockwell’s paintings of kids with their noses pressed against the glass capture it perfectly. What a magnificent bumblebee you have there, Linda! He’s a fine specimen, isn’t he? I’ve discovered bumblebees are easier to photograph than most butterflies or other bees. They seem to linger a bit longer on their flowers. I wish this were a little sharper, but on the other hand, that dangling leg is delightful. That bumble has found a very pretty “pantry”. Hasn’t he, though? If you’re going to just hang around, you might as well do it close to a source of food! I don’t suppose many subscribe to the phrase, but this one seems to take to heart…”Look before you leap”. Or maybe his radar was off just a hair. Or maybe he saw something inside that flower that he didn’t want to deal with. Since I’ve started paying a little more attention, I’ve become aware of how much “evil” can lurk in the hearts of flowers. I did find something late last night that caught my attention. 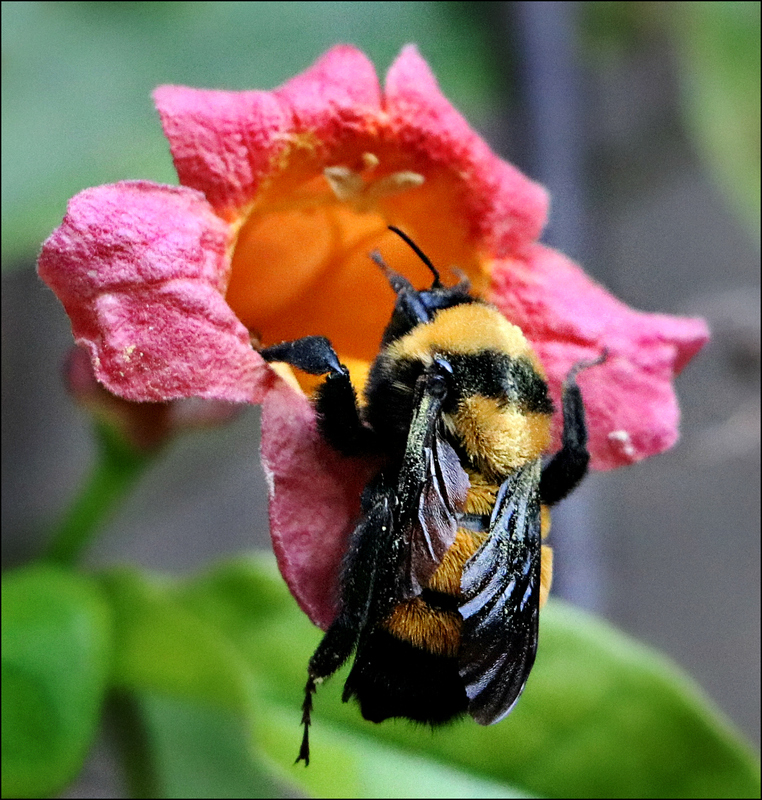 It seems that bumble bees also engage in a practice called “buzz pollination.” Crossvine’s not a flower that profits from the technique, but it’s interesting to know that bumblebees have the ability to perform such a neat trick. There’s one abandoned telephone pole I pass on a regular basis that has crossvine twining all the way to the top, where it’s tendrils wave in the breeze. I thought for the longest time it was trumpet vine, but I finally stopped and looked and figured out that it wasn’t. A friend who planted it on a trellis at the side of her house has to regularly trim it up, thanks to its enthusiastic growth patterns. But as an attractor for hummingbirds and bees it can’t be beat. I wonder if she’s just looking, or taking a breather? Most of the folks I’ve heard who play their theme song ( https://www.youtube.com/watch?v=6QV1RGMLUKE ) play it too durn fast. They obviously have never seen one fly. Yes, they do fly furiously, but at a leisurely pace. When I was out among the still-blooming basket-flowers, it was interesting to watch the bumblebees moving from flower to flower. In the first place, there were a lot of bumblebees; they clearly enjoyed those flowers. But what really caught me was their relatively slow movement. They spent a good bit of time at each flower, burrowing down into its depths, and their flight from one flower to another seemed almost placid. They’re neat creatures, for sure. I am wondering if your father hummed sonorously, like a bee, when browsing the pantry. Your photo reminded me of the Ballade my daughter wrote https://ousel.wordpress.com/category/bees/ where she uses the word hummeling for the sound made by the bumblebee. It would have been perfect if he had, but Dad wasn’t a hummer or a whistler. He was more given to puns, good or bad, and the occasional droll comment. I remember “Ballade.” Reading it again after my recent experience with the angry bumblebee was a good reminder of the ways in which experience can influence our reading of a text. Even a humble bumble can cease hummeling when an assertive buzz is required. Browsing like a bee is spot on! And so is this photo. Unbelievably remarkable detail! I think the bumblebees are especially fun to watch because of their browsing habits. It’s hard to keep up with most butterflies, or even honey bees for that matter, but these will let you follow along on their pollen tasting. And, as for painting, so for photos. Just as adding the eye highlights and whiskers made such a difference in your portrait of Lizzie, getting the details right makes a photo, too. Outstanding capture, Linda! I guess he was too busy with the flower to care whether you had a camera aimed at him, ha! He didn’t seem to have a clue, but even if he did, you’re right that he didn’t care. Of course, it helped that he had his back to me. Things might have been different, had we been nose-to-nose. When that happens, I’m usually the one who backs off. Thanks, Dina! I’m sure you have plenty of these in your garden — except not this species. I looked at your bumblebee conservation trust site, and was impressed. You have some very fancy bumbles over there — quite unlike the ones we have. Now, that’s my idea of a good time: watching bumble bees buzzing around. I’ve recently learned that flying isn’t their only trick. They also gather pollen from some flowers by vibrating their flight muscles to turn it loose. That will show up in one of my later blogs. These creatures are interesting enough to keep both of us busy as — bees? I’m anxious to see your post about them. Isn’t that the truth. Mosquitoes whine, bees buzz, and butterflies? That little flap wouldn’t disturb a nap at all. My camera’s going to have a lot more fun once I get its little glitch fixed. Thanks to a helpful woman at Houston Camera, I think I know what’s up, but I’m making a run into town tomorrow to see what the experts have to say. They’ll probably say “two weeks and two hundred dollars,” but I’ll remain hopeful. Hope springs eternal, they say. I think he might bee-lieve it.